Data from external sources is the text information that is read off from txt/xml files, or comes from the providers of informational services as RSS-resources and is displayed as the graphic “hardware” of the SL NEO server as tickers, scrolling lists, or the text lines, changing each other. 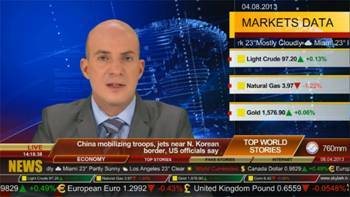 The typical examples are: info-bars, SMS-chats, news tickers, information about the exchange rates, weather etc. SL NEO platform allows visualizing and displaying text that is read off directly from the RSS-resources and also has its own RSS server that forms a local RSS resource - which, in its turn, uses one or several folders with txt- or xml-files as a source of text data. After this, RSS-data is passed to the corresponding graphic compositions and implements parameterization of text layers. 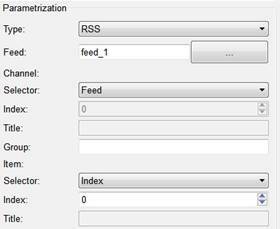 One of the ways to organize your own RSS-feed with data is using the server program module RSS Feeder at the SL NEO platform. The feeder reads .txt files from the indicated folder and exports them in the form of a proprietary RSS-resource. Step 1. Add the RSS module to the system. Stop the server components by the command Stop Server from the task bar (right click on the blue icon SkyLark NeoVid). After some time the icon will change its color to red, then right click on it and choose the item Configure Server Components. In the setting window, add the element RSS Feeder that will form the RSS feed from the field Available Components to the right-hand field. 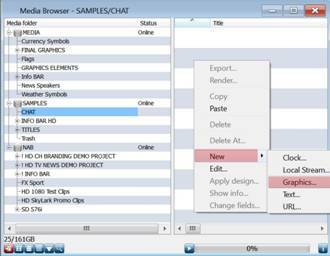 Launch the server software: right click on the SL NEO icon in the task bar and choose Start Server. Step 2. Configure the RSS module. Further settings will be implemented from the control panel - Administrator Control Panel. Enter the control console either locally from the server (right click on the blue icon SL NEO in the Windows task bar), or from any machine in the network by the address http://server_ip:7901. You should login to the control console as an administrator. After the login to the control console, choose Manage at the console menu. Then find the item RSS Feeds and choose Service Enabled in the window Feed 1. Then choose Source folders - Add. Now you should configure the RSS resource in the opened window Edit Source Folders. One of possible variants of executing the “ticker” is consecutive reading off of the text information from the txt-files stored in one folder. The text may be read off and displayed “in circle”, after the manual deletion of txt-files or adding new ones, information in the line will being updated. Item List - creating one RSS-channel for one folder with txt-files. Channel List - creating a separate RSS-channel for every txt-file. Choose Channel List for the ticker. In the field Name enter a random name for the resource, in the field Folder set the path to the folder with txt-files, choose the coding UTF-8 (in this case all initial txt-files should have this type of coding). The parameter Scrolling is used for deletion of all files after displaying, you shouldn't turn it on for cyclic repetition of text. Channel Description - none. Whole File As Is - display the whole text in the file like it is, Empty Line Separated - display the text line by line, herewith, the lines in the txt-file should be separated by an empty line, Regular Expression - using regular expressions for extraction of text fragments, the rules are set in the fields Query, XPath - using the technology of the same name for extracting the text from xml-files. Choose “Whole File As Is” for displaying the line, press OK, then press Apply Changes in the upper section of the control console window. Configuring the server part of software is finished. Checking is implemented by means of the web browser (it's desirable to use Mozilla Firefox). You should enter the address in the format http://server_ip:7901/rss and press Enter. Now, the list of active RSS resources should be displayed at the monitor. After choosing the necessary resource, you should make sure that it contains the needed text information. For creating a composition you should use the built-in graphics editor in the application Air Manager (you can open it on the right click in the Media Browser window). 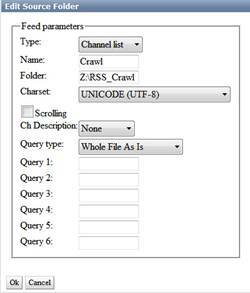 First, you should specify a source of RSS data for the new composition: find the field Data Feeds in the section General and specify the resource address in the format http://server_ip:7901/rss/RSS_name, where RSS_name is the service name set up during the adjustment of the RSS server in the control console (in our case, it's RSS_1). As it's impossible to define duration of the composition, the duration is set up as "infinite", so you should enter "--:--:--:--" into the field Duration. The parameter Lead Out should be set as 00:00:00:00. The element (layer) Text Feed of the graphic composition implements displaying the RSS-text of the line. In addition to the regular parameters that set the properties for any text layer (font, size, color etc), the element Text Feed has the parameters that set the time of displaying the text message, intervals and pauses between the messages. You should choose the element Text Feed as a source of a text layer for the line. Position - the values X and Y define the position of the window with text, the values W and H set the size of the window with the line text. Show/Hide - the parameter Sh defines the time of appearance of the text layer, the parameter Hd sets up the time of disappearing the layer. For constant displaying the line in the composition you should set up the value Sh: 00:00:00:00 relative to the beginning of the composition (In) and Hd: 00:00:00:00 relative to the end of the composition (Out). In the window Preview text you should enter the random text for viewing it in the main window of the editor, positioning, setting the color etc. Feeds - Wait Next - turned off, Pause = 0, Spacing is a visual interval between the texts that are contained in the txt-files (in pixels). Delay is the parameter for setting the delay when displaying the line beginning; it's useful in case, if you need to show the dynamic backing before the first appearance of the text. In the field Scrolling you should choose the type of scrolling for the text - Crawl. Disable means that parameterization is turned off, the server will display the text from the window Preview text. External is the type of text parameterization from the playlist lines. 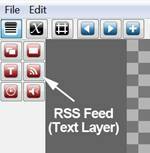 RSS is the mode of parameterization from an RSS-feed, you should choose this one. In the field Feed you should choose Feed_1 (in our example it forms RSS with a line) as a source. Set "Feed" in the field Channel Selector, choose "Index" with a "0" (zero) value in the field Item Selector. At the end of editing, save the clip by the command File/Save from the Top-menu of the Air Manager graphics editor. After this, you can view the clip in the window File Monitor and put it to the playlist line of the corresponding window Broadcast that forms the graphic layer, or include it to the list of secondary events.